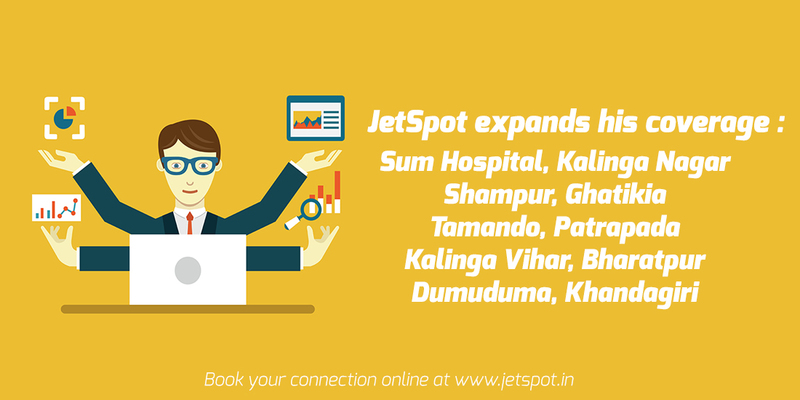 JetSpot is done with its phase III of coverage expansion and we have covered almost all of those areas, Sum Hospital, Kalinga Nagar Shampur, Ghatikia Tamando, Patrapada Kalinga Vihar, Bharatpur Dumuduma, Khandagiri. Our towers to power are at Sum Hospital and Patrapada which will cover whole of those areas. We will be deploying our Free High Speed Wi-Fi Hotspots at those towers very soon. We have received 100s of emails and calls from many customers from those areas over this last 6 months and we are as excited as them to deliver them the happiness. We have our database for everyone who had contacted us from those above areas and we will start calling each and every one and get them connected very soon. Sorry for the delay, but good things take time and we would not rush it and deliver a broken service!